Posts of a primarily image-based nature including galleries, ID requests, etc. I have a small film fragment of a western with William s. Hart. Can someone identify the movie or the other actors ? Well,that looks a lot like Tom Mix in the first frame. I'm no Hart expert but I'd guess the frames, assuming they are all from the same film, are from one of Hart's early short films circa 1914-15. Perhaps that might at least narrow it down. Yes, definitely Tom Mix top frame. And two early scenes from a Wm. S. Hart western with Bob Kortman (who was in almost all of Hart's films). Not sure about the slick dude and old woman tho at first he looks like an early Stuart Holmes to me. Good luck putting titles to these frames! I am not sure that all photos are from the same movie. Bob Kortman was a very good hint. 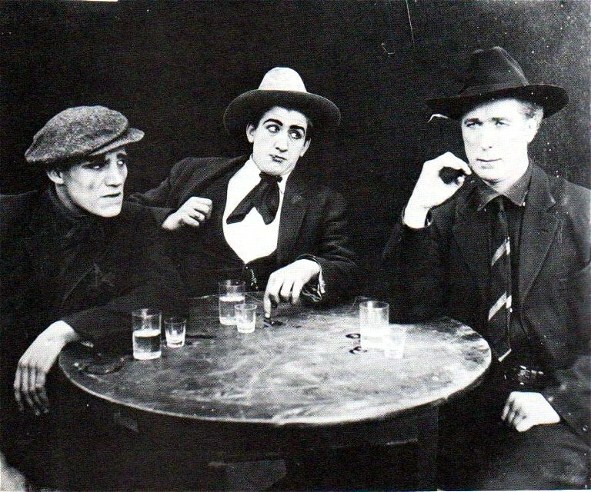 Further internet research revealed the following photo of William S. Hart, Bob Kortman and probably John Davidson. This photo fits very well with my fragment. I think the movie is "The Ruse" from 1915, so in fact a very early movie by William S. Hart. The old lady is then consequently Gertrude Claire. It is definitely The Ruse (1915). You can watch it online here. The scene in the original post is about 19 minutes into the film. The first clip is definitely from a different Tom Mix film. You can tell that the image is sharper and has much less wear.